One of my favorite things in comics is people who have to wear hats to disguise the masks they're wearing as a disguise. The problem is that the KGBeast is so good that the story becomes implausible. There is an early effort to move one of the people on the list out of town, but other than that, Batman and company take little preventative action. The last person on the list is President Reagan,* who for some reason still comes to Gotham for a fundraising dinner! 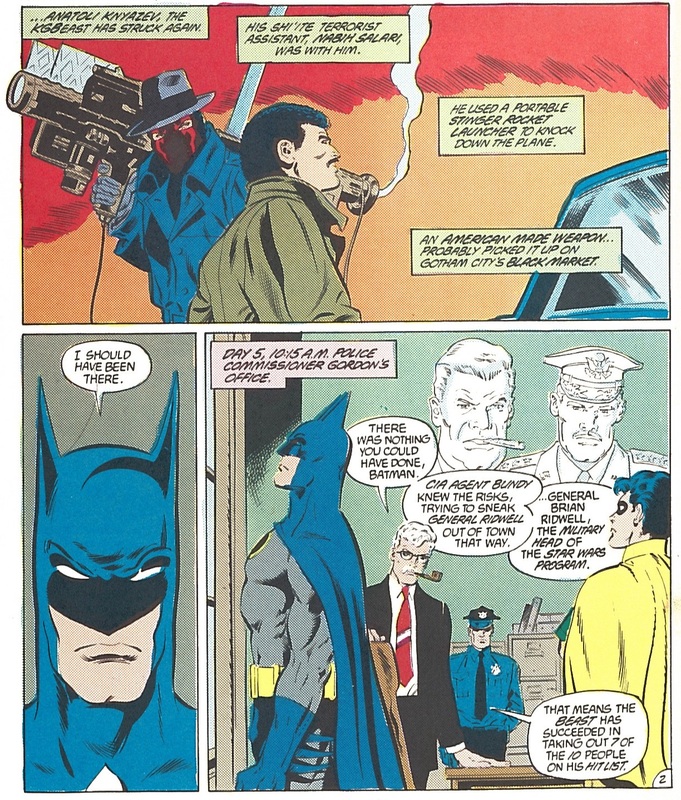 It really pushes my credulity that in a circumstance where the KGBeast has caused deaths in the triple digits in pursuit of his goal that anyone would think it appropriate to bring the President of the United States into the city where's he operating. Also, given Batman only saves the lives of about three of the people on the KGBeast's list, I don't see how the Star Wars program isn't permanently crippled. It's a very small victory, I guess. Greatest double-take in the history of comics? Jim Starlin seems to really like stories where Batman is pushed to his limit-- it's something we'll see again in The Cult and A Death in the Family-- but this one doesn't really work for me; you don't feel the desperation to the extent the story needs you to. 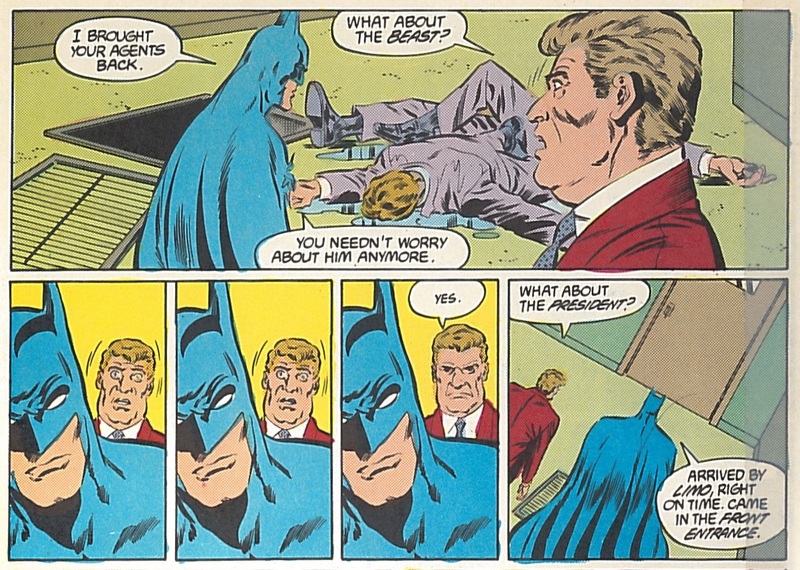 I'll expand on this in my writeups of both those collections, but I think the problem is Jim Aparo. Or rather, the Starlin/Aparo collaboration. Aparo is a great artist and supposedly a great Batman artist, but I think he's more remembered for his ten-year run on The Brave and the Bold than his late 1980s Batman stint, where I don't think he's a good tonal match for Starlin's dark and brutal scripts. But like I said, more on that next week. * Previous appearances of Ronald Regan include Legends, Millennium, and the Deadman storyline in Action Comics Weekly. There's probably more I'm forgetting. Invasion!, maybe? DC Comics really loved this guy, I guess. Next Week: Batman faces a Dark Knight of the Soul when he comes up against The Cult! We've finally got Robin III collected in the recent new Vol. 2 Chuck Dixon collection. Oh yeah! I read Ten Nights (and wrote this review) six months ago, two months before that came out.